Hailed as the quickest animals on earth, Cheetahs are also one of Africa’s fastest disappearing species, and there are only about 10 000 of these creatures left today. Human intervention in all its forms is responsible for this rapid decline of almost 90% in the last 100 years and today, the only specimens left are found in zoos and wildlife reserves throughout the world. Cheetah are rarely found in mountainous areas, their preference being for flat terrain where they can reach their famous high speeds, but this sadly brings them into conflict with mankind who also favours these areas for raising livestock and growing crops. In addition, farmers fear that these speedy cats may take advantage of their slow-moving sheep and goats come dinner time. What’s more, large herds of domestic animals make short work of available grazing, driving natural grazers and browsers to seek greener pastures or face starvation. The cheetah cannot survive under these conditions, and are thus relegated to protected places where they can live as natural an existence as possible. In the nature reserves where they are found, cheetahs are an important drawcard for tourists and earn their keep by controlling the population numbers of their prey species. Cheetahs also play an important role in maintaining healthy herds of prey by singling out only the weaker animals when hunting, hereby contributing to natural selection. Small antelope hares, rodents and (very occasionally) zebra and wildebeest are the main prey species of the cheetah and these cats are supremely adapted for hunting that requires short bursts of speed and nimble manoeuvring. The nostrils are enlarged for increased oxygen intake, the spine is designed to compress for agility, and semi-retractable claws assist in gaining traction on tight turns. While the cheetah may lack what the other big cats have in the line of size, roaring and climbing ability, there is nothing quite like the vision of a cheetah in full flight to add excitement to an afternoon game drive. 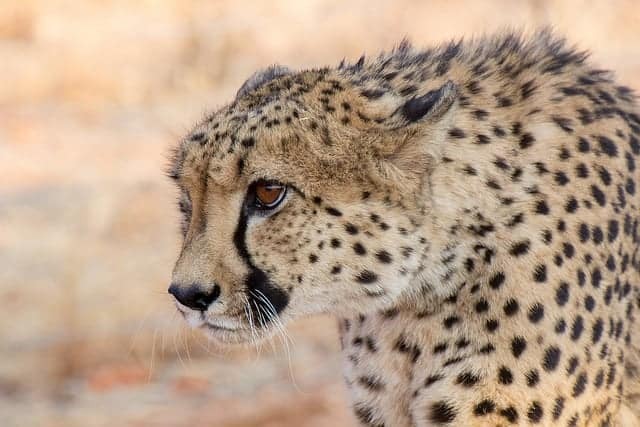 True to form, Namibia has achieved great success with its cheetah conservation efforts and is home to the largest population of cheetah worldwide, largely thanks to the Cheetah Conservation Fund (CCF) which was set up in 1990 to protect this species. You can admire the work of this organisation on a guided tour of their research centre at Otjiwarongo, just over 2 hours’ drive from your Windhoek accommodation.